Scrumptious spankings because Baby’s Got BAPT! 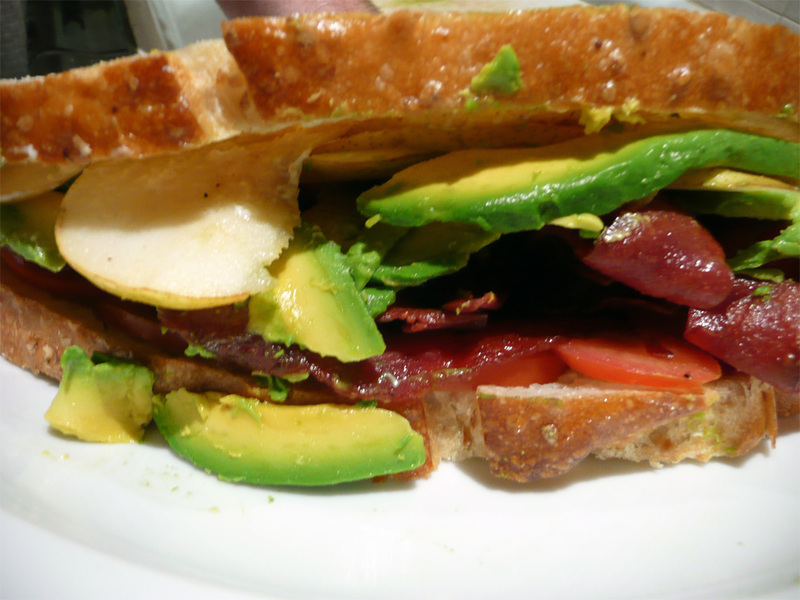 When I hear the word BLT, I see a greasy diner filled with truckers and vagabonds shoveling down gruel at 4am. But you can’t underestimate the power of bacon to transform something lame into something with game. 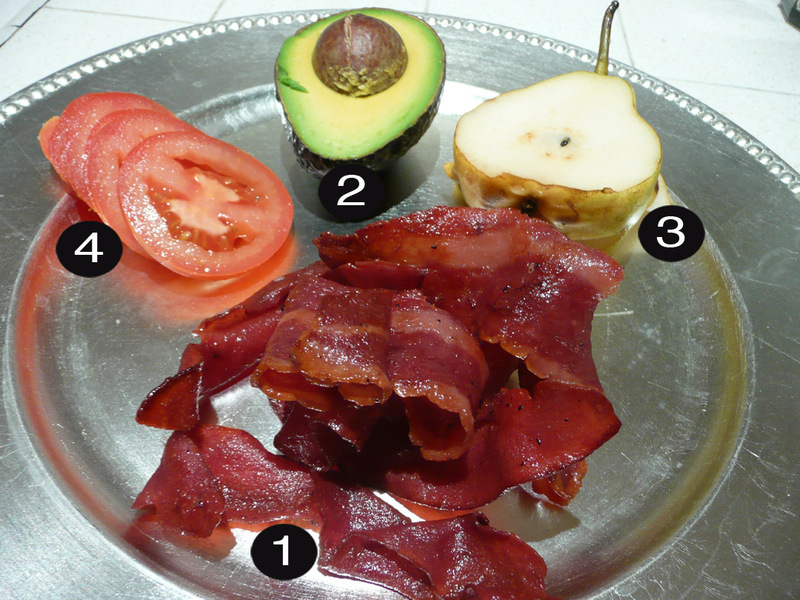 Bacon’s crispness can resuscitate flavorless iceberg lettuce and beefsteak tomatoes. It comes in so many variations that everyone from anemic vegans to carnivores gnawing on turkey legs can enjoy. So why waste bacon on lame ingredients when you can turn up the bass with something outstanding? This recipe came out of serendipitous dumb luck. I met a girl at a party with a feather boa and convinced her to come back to my place with the promise of a late night snack. But I forgot to mention my fridge was more barren than Jennifer Aniston. 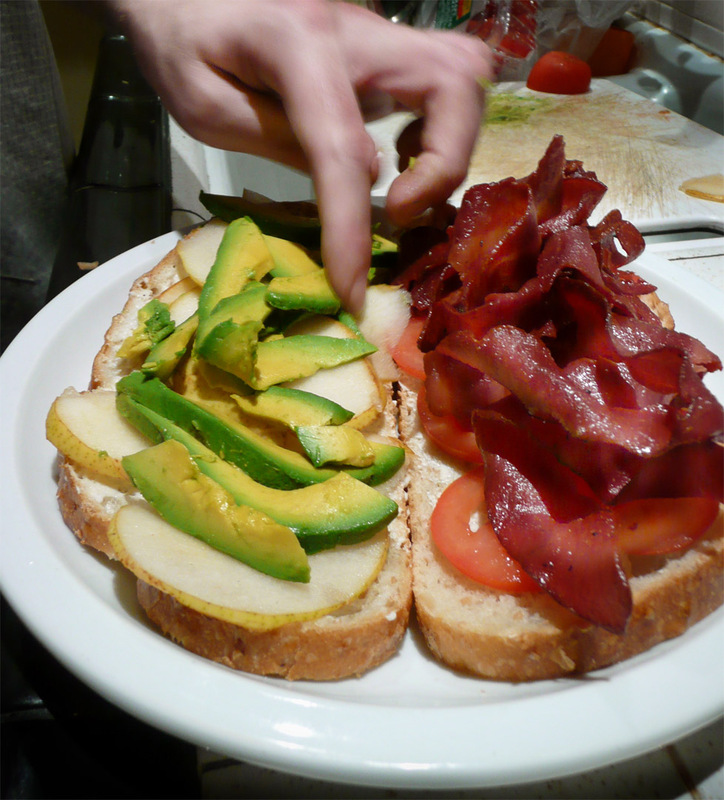 There were four near stale slices of bread, turkey bacon (she was one of those “vegetarians” who eats fish and poultry), ½ and avocado that needed to be eaten stat, and a healthy heirloom tomato. But there was no lettuce unless you count the fern in the kitchen. Luckily I had a neglected pear sit all by itself in the fruit bowl just begging to be eaten out. My hot hungry companion went from skeptical to agreeable in the time it took to toast the stale bread. The feather boa remained on the whole night, but her clothes were not so luckily. Fry the bacon in a pan until crisp. Pat the grease dry with a paper towel and set aside. 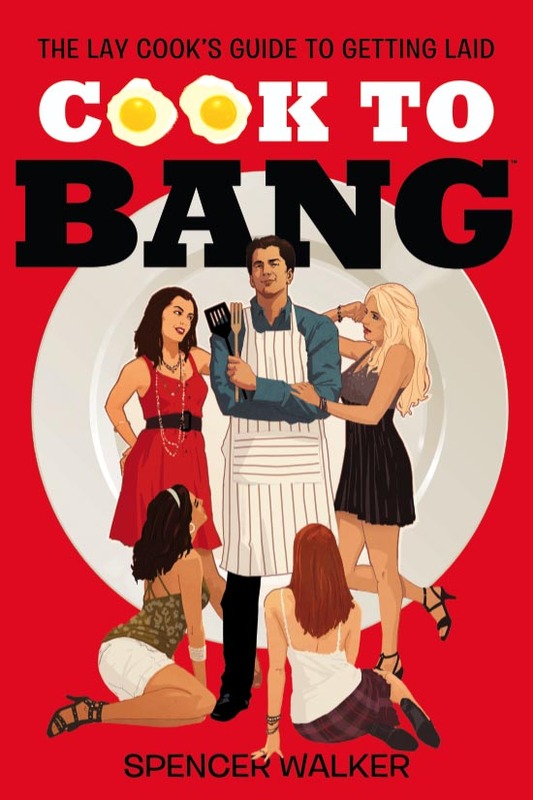 Toast the bread of your choice and add favorite condom-ments; CTB recommends sourdough or cracked wheat with wasabi mayonnaise spread on one side and goat cheese on the other. Assemble the sinwich however you like, spreading the ingredient evenly across the bread and close up shop. 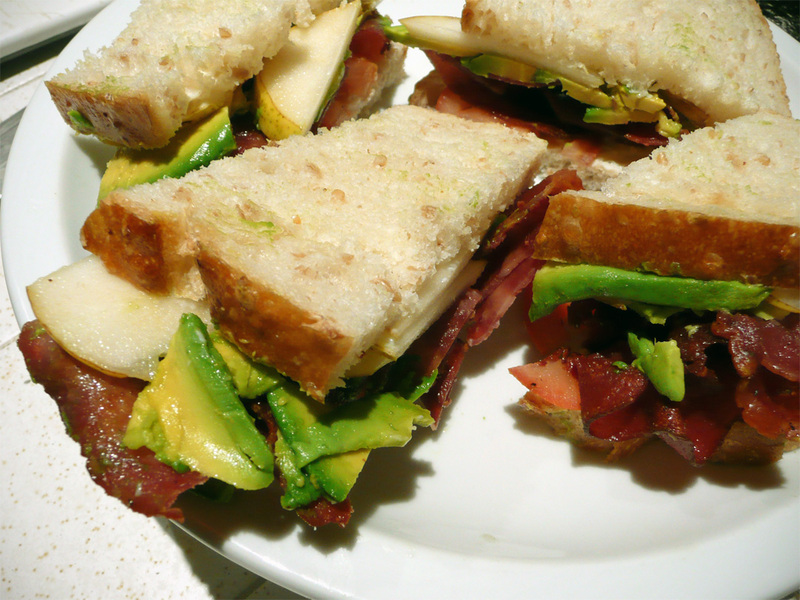 Cut the sinwich in half (or smaller) before serving because it’s both less messy and classier than San Diego. Thank God for this site! I work with this Australian girl and finally grew the balls to ask her out, and because of your brilliant theory I invited her over for dinner. I don’t know if the pear and avocado were aphrodisiacs or if it was the wine or the fact that the bedroom was just a few feet away, but it was the easiest time I’d ever had visiting the down under. Thanks for the recipes, and keep em coming. I’ve got to keep this up!